As an instrument of the drum beat. Consists of several drums and cymbals. Using the drums alone. And using a foot pedal for the bass drum. Drum kit is commonly used with most types of music. 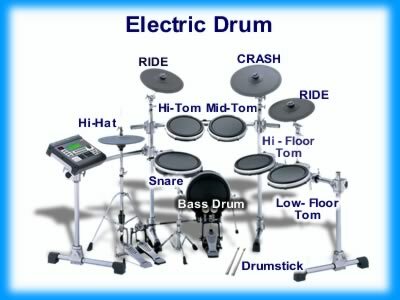 The electronic drum usually consists of a set of pads mounted on a stand in a disposition similar to an acoustic drum kit. The pads are discs with a rubber or cloth-like coating. Each pad has a sensor which generates an electric signal when struck. The electric signal is transmitted through cables into an electronic module, which produces a sound associated to the selected pad.